Today is Rock Flipping Day: Get Out There! So I set out with the camera and my rubber boots to flip rocks in the creek. This is an activity that, for some–for most I imagine–is quite an unusual thing to do. I confess, I cannot leave a stone unturned. So for me, every day is Rock Flipping Day. But honestly, until Hurricane Faye brushed us a couple of weeks ago and rejuvenated the creek, I had been leaving the stones in Goose Creek alone. Any creature lucky enough to have found a protected place with any moisture should be left alone to die an inevitable death the drought would have brought in another few days. Now, even though Hanna was no help, the creek has enough flow to hear from the front porch in the dark. And there is life! And the creek shows good health once again. Speaking of good health–it was an “indicator organism” I thought perhaps I could find for my Rock Flipping Day post. I’d seen Water Pennies in Goose Creek at times, but had to look hard for them, especially after the illegal dumping of a drum of used motor oil upstream and some upstream outhouse issues. So today’s the day–September 7: International Rock Flipping Day. There’s still time. Get out there ready to sketch or snap what you see under a rock near you! You’re almost guaranteed to learn something. Send your submission to Dave at the email link. Do it now! And send it along, even if it’s a few days late. Bonus link: How to Be a Curious Photographer We could all use some curiosity boosting in our times. Let the little things amaze. Stir things up a bit. I think it was Mark Twain who said “you’ll learn things picking a cat up by the tail that you’d never have known otherwise” or some words to that effect. Turn rocks. And jump back! And in the case of terrestrial rocks anyway, it’s best to replace them after you’ve turned them. It is a microhabitat, after all. And like Pablo sez, replace the rock after flipping. Great post. 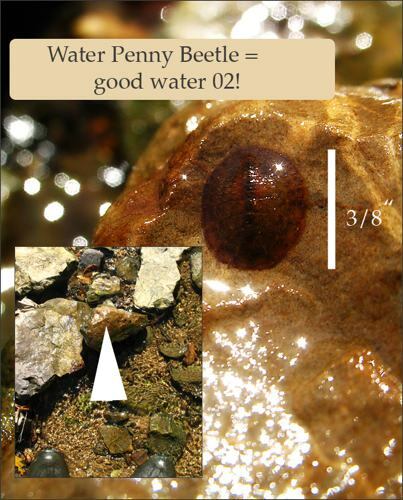 Penny bugs live in my pond – I didn’t know what they are. Thanks for naming yet another creature I hadn’t known the name of.